Music is as fundamental to the character of New Orleans as red beans and rice, which is why I always stop by the Louisiana Music Factory whenever I’m in town. The place focuses on regional music, from New Orleans jazz and R&B to zydeco and early rock ‘n’ roll, and its multiple listening stations are an aural smorgasbord. Every trip unearths a few gems; here are a couple of my favorites. Much like “Johnny B. Goode” sounds as fresh in concert today as when Chuck Berry first recorded it in 1958, the Shotgun Jazz Band’s old-school jazz selections are infused with a vitality that belies their age. 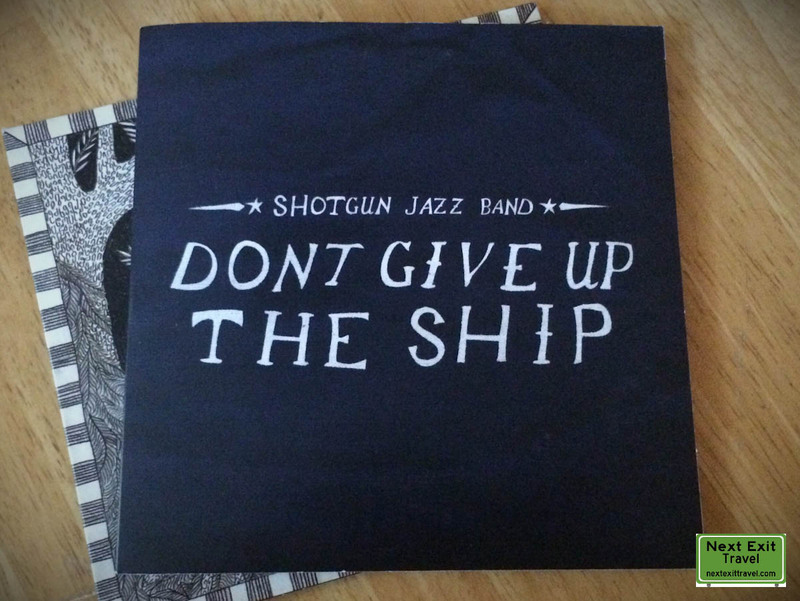 Indeed, tracks like Zilner Randolph’s “Old Man Mose”, the opening number on SJB’s 2013 album, Don’t Give Up the Ship, spring from a nearly century-old repertoire. SJB sweeps aside the at-times too-cool-for-school jazz of the mid-20th century onward, and instead lunges straight for its roots in the New Orleans of Satchmo, the Kingfish, and Prohibition. The band’s “fairly consistent” core lineup – including Christopher Johnson (tenor saxophone); Michael Magro (clarinet); Peter Loggins (trombone); Justin Peake (drums); John Dixon (banjo); and Tyler Thomson (bass) – produces a tight sound that still affects the breeziness of an impromptu hootenanny. Other highlights include jaunty covers of Wooden Joe Nicholas’s “All the Whores”, Sam Morgan’s “Short Dress Gal”, the Harlem Hamfats’ “Weed Smoker’s Dream”, Bessie Smith’s “Nobody Knows You When You’re Down and Out”, and a few infectious originals, such as the title track and “Girl, You Better Use Your Head”. The album’s cover art (and title) draw upon Commodore Oliver Hazard Perry’s battle flag commemorating the dying words of Captain James Lawrence during the War of 1812. 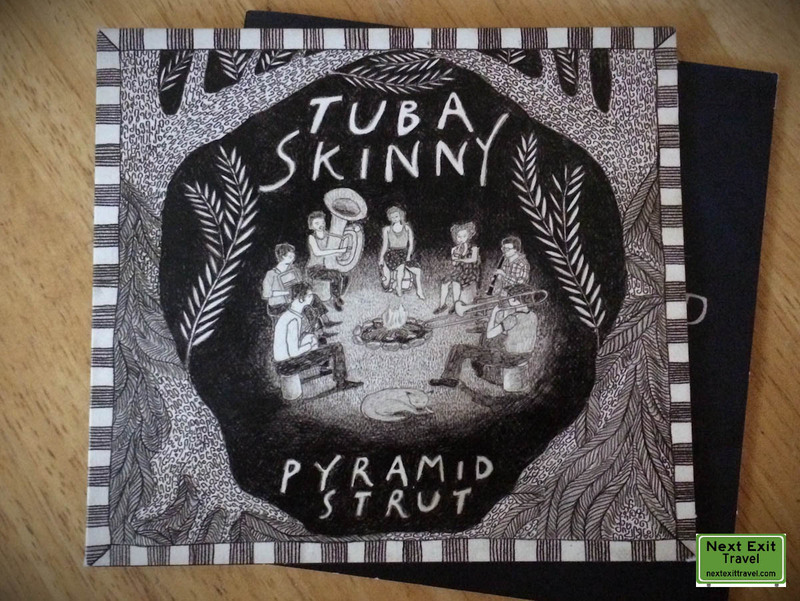 Fellow New Orleans jazz revivalists Tuba Skinny launch their latest full-length effort, Pyramid Strut (2014), with their take on Bunk Johnson’s “Big Chief Battle Axe” and from there throw an all-hours party. As the Cramps famously did for forgotten garage and rockabilly, so Tuba Skinny resurrects obscure and long-forgotten tracks from the early days of jazz and blues, such as Victoria Spivey’s “Blood Thirsty Blues” and “Mean Blue Spirits”, a variation of Bessie Smith’s “Blue Spirit Blues”. The band’s line-up includes Todd Burdick (tuba); Westen Borghesi (tenor banjo); Jon Doyle (clarinet); Barnabus Jones (trombone); Shayne Cohn (cornet/fiddle, as well as the album’s cover artwork); Robin Rapuzzi (washboard); and Erika Lewis (vocals/bass drum), whose voice can conjure heaven, hell, and everything in between within the span of three minutes. What’s more, the band is insanely prolific. While Pyramid Strut (Tuba Skinny’s fifth full-length record since 2009) was just released in early 2014, as of this writing (August 2014), the band’s website already reports the completion of its next album, Owl Call Blues. While both bands amply demonstrate their musical chops, the music they play itself hearkens back to the bouncy simplicity of early-era jazz, much like the early days of rock and roll and Chicago blues, before both were overrun by dorm-room wankers and 12-minute guitar solos. Both albums are available through Louisiana Music Factory, or directly from the artists’ websites.